Anticline: An arch-shaped fold of stratified or layered rock in which the layers bend down and away from the crest. The oldest layers form the core, while the outer layers of the fold are younger rock. Anticlines with reservoir-quality rocks in the center core and impermeable layers at the outside of the fold make excellent petroleum traps. An anticline is the opposite of a syncline, which occurs when the rock layers fold upwards in a U-shape. Benzine: An early term for gasoline, not to be confused with benzene. Benzine is a colorless, flammable mixture of liquid hydrocarbons obtained from petroleum and used in cleaning and dyeing and as a motor fuel. 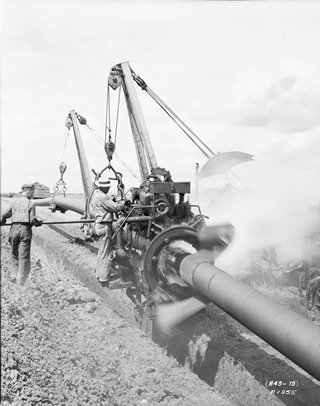 Bit: The cutting or boring tool used to drill for petroleum. It is located at the working end of the drill string or drilling line and is equipped with various types of cutting or grinding teeth. 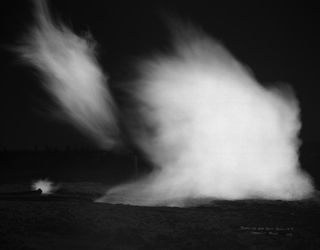 Blowout: A petroleum well that goes out of control and literally blows out, spewing drilling mud, natural gas, oil, and other liquids out of the well. Blowouts occur when formation pressure exceeds the pressure exerted by the column of drilling fluid. British thermal unit (BTU): A unit of heat commonly used in heat engineering and corresponding to the amount of heat required to raise the temperature of one pound of water one Fahrenheit degree. Butane: A colorless, flammable gas that occurs in natural gas and is used as a fuel, often for small household devices such as lighters, as a refrigerant as well as in the manufacture of rubber (C4H10). 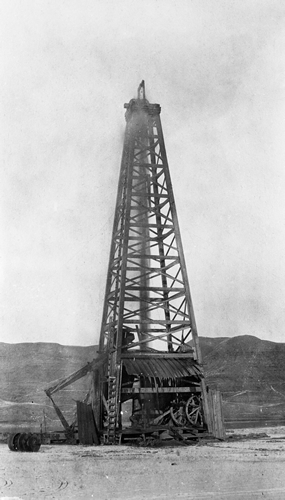 Cable-tool rig: A device used to drill for oil and natural gas that uses a heavy, chisel-like bit suspended on a cable and dropped repeatedly into the rock at the bottom of the hole. Carbon: A natural element found in petroleum and derived from trapped organic material. Casing: Steel pipe inserted into petroleum wells to prevent well walls from caving in and fluids from entering the borehole. Casinghead gasoline: Gas that is dissolved in crude oil and so is produced from an oil well rather than from a gas well. Combustible: Able to catch fire and burn. Combustion: A chemical reaction that produces heat and light; the process of burning something. Condensates: Hydrocarbons that sometimes accompany natural gas, as at Turner Valley. Liquid at normal pressure and temperature, they may be refined into fuels and sold commercially. 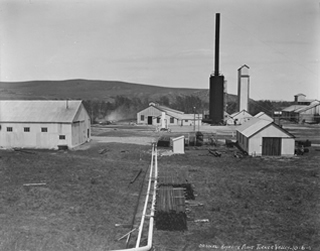 In Alberta, they encouraged further petroleum exploration as well as the construction of processing facilities. As liquid hydrocarbons, condensates bridge the line between natural gas and conventional oil. Creekology: A rudimentary science of petroleum geology. Debenture: A document recording a debt that is not founded upon collateral. Derrick: The large, load-bearing tower-like framework over a gas or oil well that supports the drilling tools and their accessories. It was once made of wood and constructed piece by piece but began to be made of bolted steel construction in the 1920s. 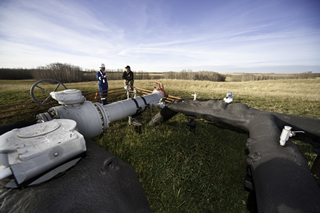 Metal rigs are stronger, less flammable and better able to withstand strong prairie winds. Devonian: A geologic period of the Paleozoic Era from about 450 million to 345 million B.C.E. 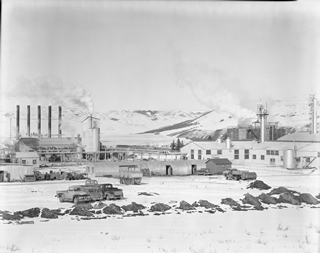 Much of Alberta’s petroleum comes from rock formations of this period, which was dominated by marine life. Doodlebugger: A kind of instrument or gadget with no recognized scientific method that is reputed to find oil, gas, water, or minerals. 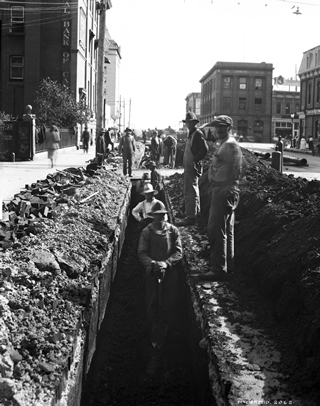 The term also refers to someone using such non-scientific methods to find oil, gas, or minerals. Downstream: That part of the petroleum industry that delivers oil and gas to the consumer. Dowser: A person who uses a divining rod to locate underground minerals or water. Drilling rig: Machinery that is involved in drilling petroleum wells, including the derrick, the hoisting equipment, the drill string, the pumps and the mud system. Dry gas: Gas that is essentially devoid of liquid hydrocarbons. Duster: A dry hole that produces neither gas nor oil in commercial quantities. Ethane: A gaseous, colourless, flammable hydrocarbon (C2H6), slightly more complex than methane, that is used as a building block for the petrochemical industry. Eukaryotes: A classic cell, or single-celled organism, having an organized nucleus. 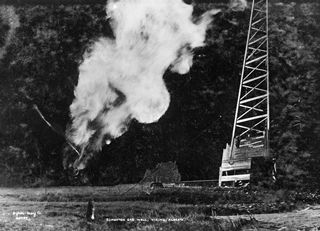 Flare: A pipe or tower that burns off excess or unwanted natural gas. Foothills: Any of the low hills around the base of a mountain or the hill country in Alberta lying east of the Rocky Mountain chain. Formation: An identifiable geological unit or location where gas and oil are found in rock. Fossil fuel: A hydrocarbon deposit formed in the geological past from the remains of living creatures. Through combustion, the hydrocarbon provides a non-renewable source of fuel. Fracturing: A method of stimulating production by injecting sand, water, and/or certain chemicals into cracks in layers of sediment in order to increase the permeability of the rock and thereby release trapped petroleum. Gas plant: A facility that processes natural gas. Geophone: A special receiving microphone used in seismic operations in order to detect sound waves created by seismic explosions; also called a jug or seismometer. Geophysics: The study of the physical properties of the Earth and the physical processes of its environment, including the fields of meteorology, hydrology, oceanography, seismology, volcanology, geomagnetism. Greenhouse gas: An atmospheric gas emitted from the extraction and/or processing of petroleum that is believed to contribute to global warming by absorbing infrared radiation. 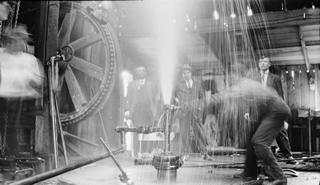 Gusher: A well that comes in under such pressure that it spurts gas or oil uncontrollably. Improved drilling technology has made gushers rare. Hydrogen sulfide: A toxic compound (H2S) with a strong odour like that of rotten eggs. It is the component that makes so-called “sour” gas sour. Kerogen: The fossilized material within sedimentary rock that can yield hydrocarbons under suitable temperature and pressure conditions. Liquefied Natural Gas (LNG): Natural gas that is super-cooled in order to maintain it in a liquid state and at a fraction of its original volume. 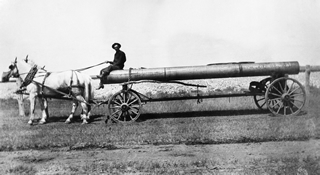 In this way, it is much easier and less expensive to transport if pipelines cannot be used. 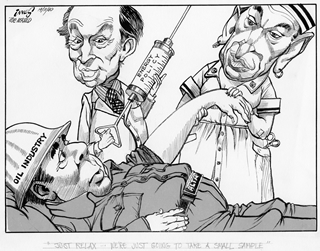 Mercaptan: A substance added to natural gas that gives it an unpleasant odour in order to make it detectable. Methane: The most basic hydrocarbon (CH4), a colourless, odourless, flammable gas that is lighter than air and is the primary component of natural gas. It is also a by-product of the decomposition of organic matter. Methane releases a large quantity of heat when burned. Naphtha: A flammable, liquid mixture of hydrocarbons distilled from petroleum and used as a fuel. 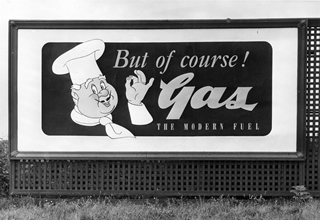 Natural gas: A gaseous form of hydrocarbon. Methane is separated from other components found in natural gas, such as ethane, propane, butane, pentane and hexane, at processing plants located near producing fields. Natural gas liquids (NGLs): Naturally-occurring hydrocarbon components of natural gas. Because they are valuable in and of themselves, they are removed during natural gas processing and then separated into distinct by-products including ethane, propane, and butane among others. Kept under pressure, they can be easily transported as liquids in tanker trucks. Petroleum: Derived from the Latin roots, petra, meaning “rock,” and oleum, meaning “oil.” This is the general term for all the naturally occurring hydro-carbons, including natural gas, natural gas liquids, crude oil, and bitumen. Petroleum is a non-renewable natural resource found within the pore space of rocks. 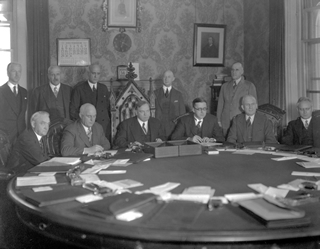 Petroleum and Natural Gas Conservation Board (PNGCB): A board created in 1938 to oversee the development of the Alberta oil and gas industry and to control economic waste. 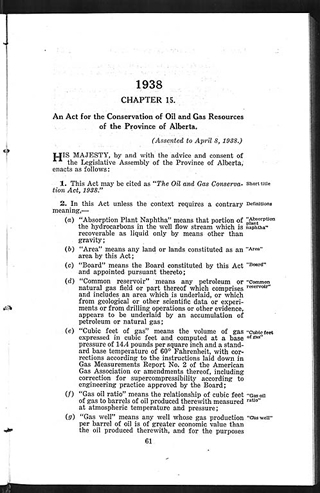 It subsequently becomes known as the Oil and Gas Conservation Board (1957), Energy Resources Conservation Board (1971), the Alberta Energy and Utilities Board (1995), and the Energy Resources Conservation Board (2008) again. 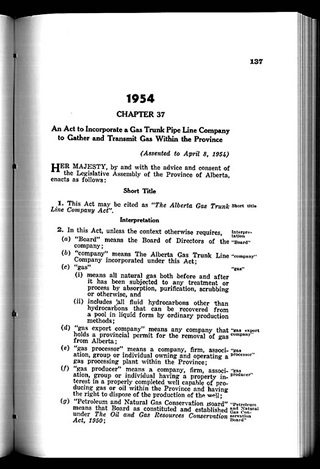 In 2013, its regulatory functions became the responsibility of the Alberta Energy Regulator. Propane: A colourless, flammable hydrocarbon component (C3H8) found in natural gas. When kept under pressure, it remains in liquid form. It is used for cooking, heating, and other domestic and industrial purposes. Reserves: The amounts of gas and oil recoverable from within the Earth. Reservoir rock: A permeable rock, usually sandstone or limestone, that contains quantities of petroleum within its pores. Rig: The derrick and surface equipment of a drilling unit. Rotary drill: A technology using a rotary drill pipe and bit, or one that bores its hole by rotating the drill stem and bit. 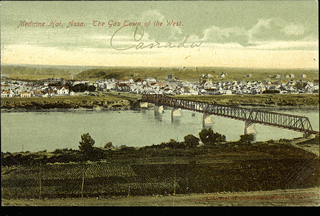 Rotary rigs were introduced in Texas in the 1890s and in the Turner Valley, Alberta, in 1925. 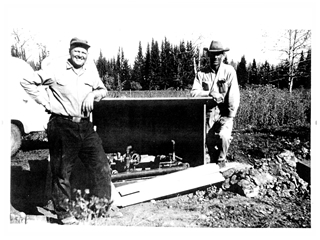 Rotary drilling was not used widely in Canada, however, until a new exploration in Turner Valley began in 1936. Roughneck: A member of the derrick floor crew as distinguished from the driller. 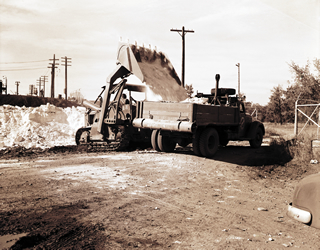 Scrubbing: A procedure used to extract toxic hydrogen sulfide from sour gas to make it safe for consumer use. Sedimentary rock: Rock that is composed of sediment, or particulate matter carried by water, and compacted by pressure. Limestone, sandstone and shale are sedimentary rocks. Seep: A location at which hydrocarbons have migrated to the Earth’s surface. Seismic waves: Waves of energy that travel through the Earth. They can be generated naturally by earthquakes or artificially, such as by explosions. Seismology: A modern method in geophysics, based on the fact that sound waves travel through different kinds of rock at different speeds, used to find gas, oil, water, or minerals. Shale gas: These natural gas equivalents, also known as coal bed methane, are extracted from coal beds and certain shale deposits. Solution gas: Natural gas that is dissolved and held under pressure in crude oil in a reservoir. 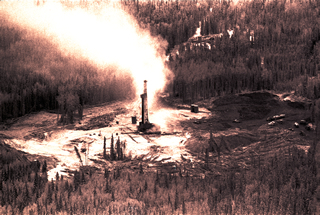 Sour gas: Natural gas that contains toxic hydrogen sulphide (H2S) and is often found in deep, high-pressure natural gas deposits such as those in the foothills of Alberta’s Rocky Mountains region. Source rock: The sedimentary rock formation where organic matter was trapped and transformed into natural gas and crude oil although not always the site of petroleum accumulation. Spud: To begin drilling operations, or begin making a hole, by moving the drill stem up and down in the borehole without rotation. Sulfur: An odourless and tasteless chemical element having a pale yellow colour and occurring widely in nature. Sustainable development: A pattern of resource use that meets human needs while at the same time preserving the environment. Sweet gas: Natural gas that has been cleaned of impurities, particularly of hydrogen sulfide (H2S). Trap: A geological feature that stops the free flow of petroleum to concentrate it in a limited space. Volatile: Readily evaporated at normal temperatures. Wet gas: Gas that is partially saturated with liquid hydrocarbons. Western Canada Sedimentary Basin: A geographic area with several source rocks (Ordovician, Upper Devonian, Uppermost Devonian and lower most Mississippian, Middle Triassic, Lower Jurassic, Lower Cretaceous and Upper Cretaceous) that contain active petroleum systems. A sedimentary basin is usually a depressed region, shaped like a basin. Wildcat: A drilling operation that seeks new petroleum prospects outside proven (cable of producing) production.